This week I'm so happy to have a friend of mine, Chelsea Horton, the the blog today, talking all about being an independent designer and what her daily life is like. You can also check out her Tattoo Tuesday here. I find Chelsea to be one of the most inspiring women (ever) and I know all of you will really enjoy her story. And be sure you check out her blog too if you don't already have it as a daily read - she's one of my most favorites and I always leave her site feeling so happy after being surrounded by so much beauty. I'm looking forward to the day we can sit down for a cup of tea and have some good girl talk, but now I'll settle for immersing myself in her fabulous blog. Thanks again Chelsea for being a part of this feature! I’m Chelsea Horton, a 23 year old, self-employed Owner/Designer of SEABLANKET, a personal style blog and women’s online clothing store based out of Portland, Oregon. My day begins at 7:30 on weekday mornings with a strong cup of coffee and yoga. I think it’s important to begin my workdays by exercising my mind and body to prepare for the long day ahead. Yoga is followed by a shower and breakfast, then I head to my studio. There, I review my daily goals and create a list of to-do’s that must be completed that day. By 9am I start creating. This could mean either sketching new pieces, drafting patterns by hand, fabric shopping, packaging and shipping purchased items, or sewing countless articles of clothing. I work like an assembly line when creating my handmade pieces. Starting with cutting fabric, then pinning and draping when needed, and finally sewing and perfecting each individual piece. I try to wrap up my workday by around 4pm, but often I find myself working into the evening as I loose track of time. I always listen to great albums or watch my favorite movies and tv shows when creating to keep myself focused on the physical sewing process and out my head. I wrap up every work day by cleaning my studio so that it’s a fresh slate for the next work day. Did you always want to be a designer? How did you get into this field? What kind of schooling or background did it entail? I’ve always wanted to be a designer. I’ve been sewing and sketching dress ideas since I was 4 years old. My mom took notice of my love of art, specifically with sewing at an early age and enrolled me into private sewing lessons. Soon, around my first grade in elementary school, my friends were wanting to sew too, and my private lessons turned into a fun, after-school group sewing class. From there, I began designing and sewing my own creations at home for myself, my dolls and even our poor family dog. While none of the pieces I made were revolutionary, this freedom to turn an article of clothing I had in my mind and turn it into reality gave my heart and imagination wings. I strayed from my love of sewing in Middle School, and it wasn’t till my freshman year in College where I chose to take a Theater Wardrobe & Design course. I realized then that I still enjoyed, even loved and really needed to be sewing/designing as a career. I’ve been actively creating and working towards my goal since. Is this what you hope to do for the rest of your life? 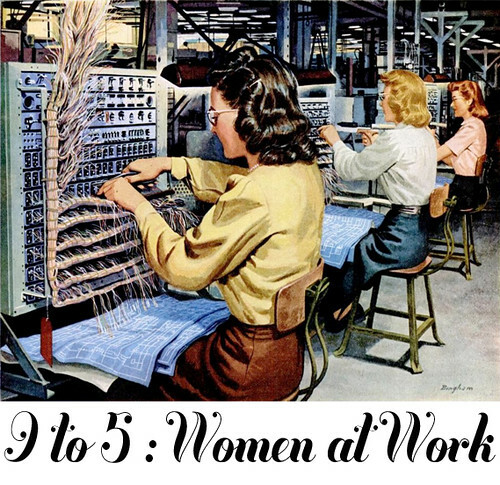 Where do you see yourself in 10 years, career-wise? 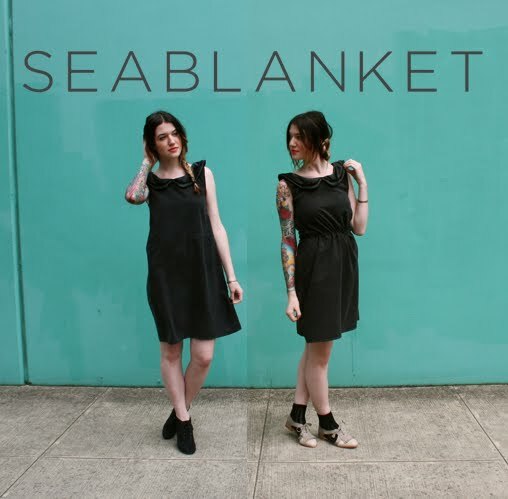 I’d love to pursue SEABLANKET for the rest of my life. I see it as a little seed that I planted long ago that is finally sprouting up from the ground. I hope to one day see it grow tall and blossom into a beautiful dream come true. I hope one day to have 2 beautiful collections each year, and have starlets and street fashionistas alike donning my pieces. I’ve also always dreamed of having my pieces in stores and magazines... I believe that with my persistence and motivation this is a reasonable goal. On a smaller scale, I see myself as a fashion journalist or blogger for years to come. I’m inspired by fashion. When I see the latest Marc Jacobs, Prada or Alexander Wang collections, I’m moved by the beauty, architecture, and soul in each piece and also the guts the designers had to take the risks they’ve taken. I love feeling each piece of clothing I buy, it’s like hugging a new friend. I know it may sound crazy, but I’ve got a passion for making women feel beautiful, and I feel no shame in wanting to pursue a career for that sake. I was such a slacker when I was 17. I had no direction and was really lost in the world. I had spent all of high school trying to fit in and avoided all of the quirks and unique traits that are what I now use daily to create and live by. If I could change a thing about the past would be to listen to my intuition and shoot for the stars. SEABLANKET has only been alive for a year and a half, and already I am self-employed and more content than ever. I wish I wouldn’t have waisted my time with insecurities and self-esteem issues and started pursuing my dreams at a much younger age. I would have loved to go to school for fashion design (although my free spirit would’ve hated every second of it, haha). I do wish I would have began blogging and designing sooner. I feel like I got a late start, but it’s giving me the inertia to move forward at a quicker and more direct pace. Man, Chelsea is so great. I wanna collab with this girl!! Love the feature on her and LOVE that quote! So inspiring...heading over to check out her blog now! I LOVE that quote! It is exactly what I needed to hear right now. 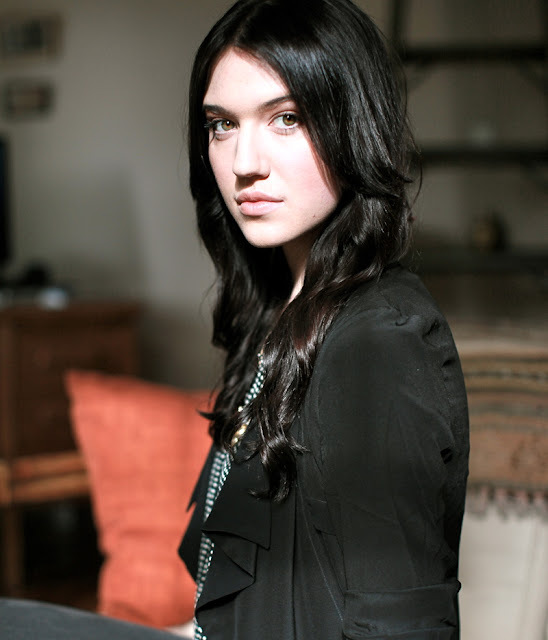 beautiful post, i'm in love with her!! Oh my, she is awesome! So adorable!! She's adorable and I love her style! So on the ball for 23 years old! 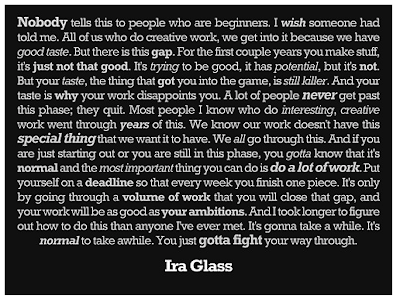 Lovely post - and the quote at the end by Ira Glass - I died. He is one of my faves and his words were just what I needed to hear! I love Chelsea and her blog, and I LOVE that Ira Glass quote. I have to remind myself of this quote constantly because I am a fledgling at most things I do, and I need to remind myself to push past that nagging in the back of my head and produce great work. I love this, I already love Seablanket the blog, she posts so much gorgeous stuff. Reading this is hugely inspiring. It is so amazing for people (like me) who dream of being self employed to know that that dream can come true. This is by far my favourite blog series yet! So inspiring. I can't believe she is only 23 and is so focused! At 23 I was half heartedly going to university to study something I wasn't really interested in, and the rest of the time I think I was probably partying! It's taken me until 28 (nearly 29) to really figure out what it is I want to be doing. Awesome feature! Hugs to you & Chels. Love my girls. awesome post..I'm going to go check out her blog right now. He tattoo with the girl and the deer is one of my favorite and most beautiful pieces!! 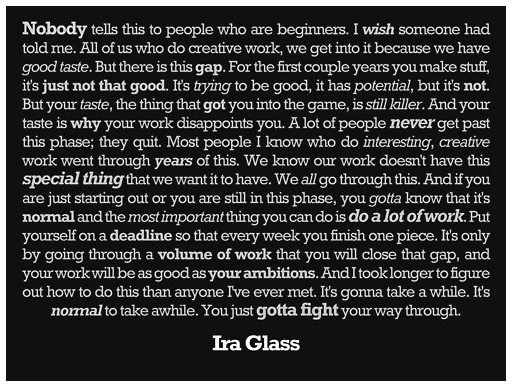 Thanks for sharing Ira Glass' quote. I admire his work so very much! I love Chelsea's blog! It was one of the first blogs I followed. And as for the quote... Wow. That's inspiration.